Cooking healthy snacks for a child who has almost zero interest in food is a herculean task. When none of the time-tested tricks of my mother work, nor do the tips from the Internet help salvage the situation, I choose to do what I am best at. I have to admit that cooking the toughest, trickiest recipes never intimidate me, but serving them beautifully is where my culinary skills end. Artistic presentation to lure a child takes me more thought than trying multiple recipes a day. This limitation has forced me to seek respite in the colorful foods. 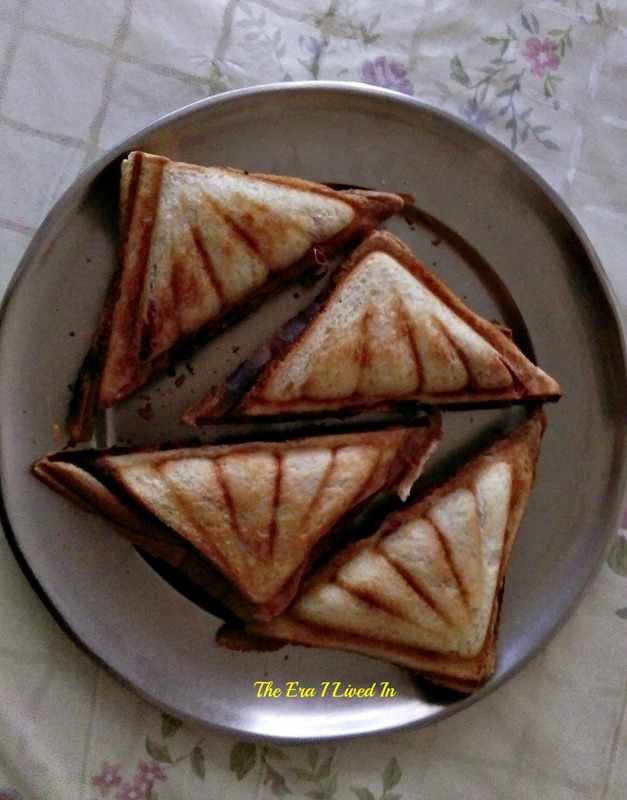 I try to play with colors in salads, sandwiches, cakes and more to make food look tempting for Pari. Mind you, I am talking about the natural colors of fruits and vegetables not the artificial ones. In one those attempts I tried this recipe. The ravishing red of the beetroot when mixed with the playful orange of the carrots not only adds to the nutrition and tempting colors but also cuts down the potato ( which is nevertheless still present to help in binding and keep the authentic flavors intact). In a large bowl grate boiled potatoes, beetroot and carrots. Boiled and grated beetroots, carrots & potatoes. To this mixture add half of thee finely chopped ginger, chat masala, bread crumbs, salt and roasted chana powder ( prepared by grinding the dry roasted chana dal). Mix it all together and divide the mixture into small portions. In another small bowl mix the remaining hopped ginger, finely chopped green chilies and finely grated mozzarella cheese. Add the cheese mixture as a stuffing in the beetroot and carrot mix portions and gently shape the cutlets as thick discs. In a non-stick/ thick bottomed pan add 1 tbsp oil and shallow fry the prepared cutlets from both sides till they get a crisp, golden hue. Serve hot with a cheesy dip or coriander mint chutney or tomato ketchup. Tip: The cutlets can be used to make healthy, finger licking good burgers that look gorgeous with the red and green ( salad leaves of your choice). What I also do is stuff up the beetroot and carrot mixture with or without the mozzarella mixture to make sandwiches that Pari loves taking to school. So this recipe is a winner snack that can be used in many creative ways. Wow! That looks delicious! Will try it out! 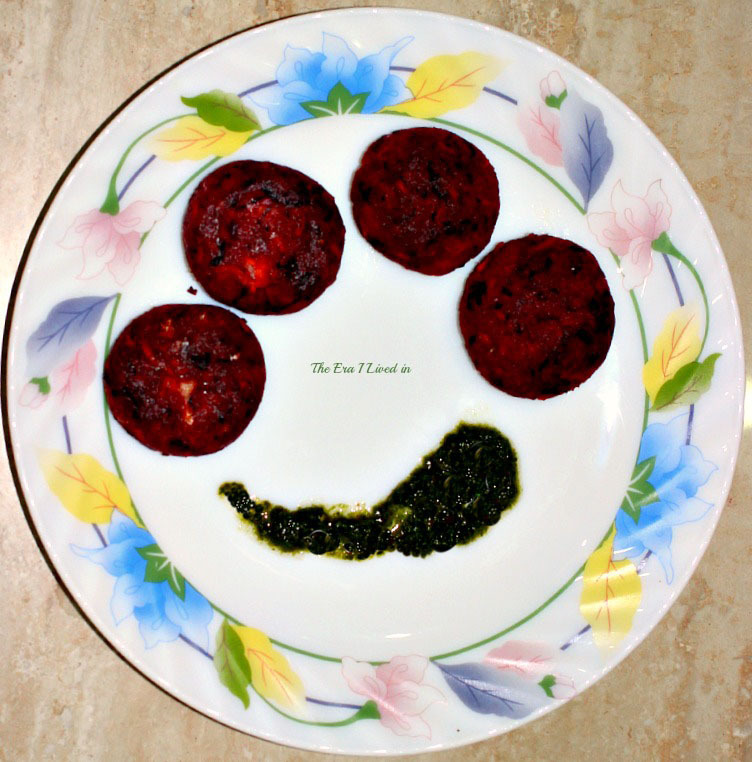 I make green pooris and paranthas all the time and Pari quite loves the greens that way. 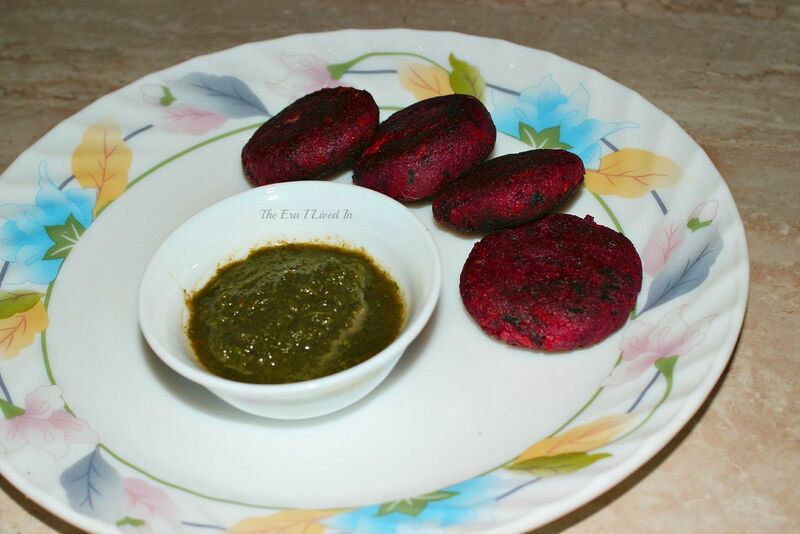 Wow look at that mirchi-shaped green chutney! And those cutlets look so tempting! But here no one to help or feed me so slowly I have learnt to cook and sometimes I can cook something goood. .He he he he..
You have some tasty looking recipes here and I never checked them out. Beets and carrots are my least favorite veggies and this looks like a good way to get my tummy hating food to eat them. Are the cutlets sweet in taste? No. These cutlets taste like any Aloo Tikki ought to with a cheesy goodness on the inside.